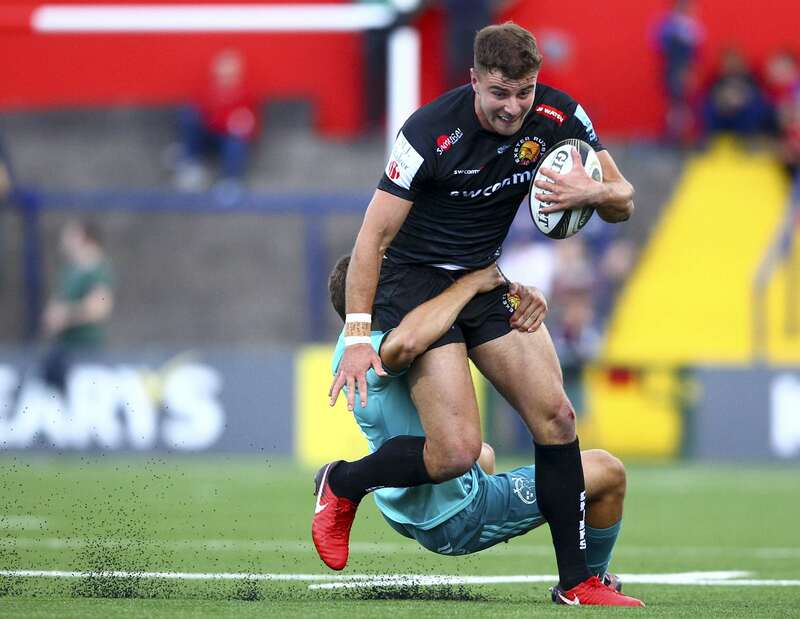 Rob Baxter said he wanted his Exeter Chiefs side to be tested this pre-season – and that’s exactly what they’ve undergone during three hard-fought encounters. In their final outing before the start of a ninth Gallagher Premiership campaign, first half tries from Olly Woodburn and Harry Williams, plus a conversion from Gareth Steenson, proved sufficient enough for them to sink hosts Munster. Lively and energetic in attack during a dominant first half display, Baxter’s side then showcased equally impressive credentials after the break as they served up real intensity and desire in defence to keep their rivals scoreless on the night. 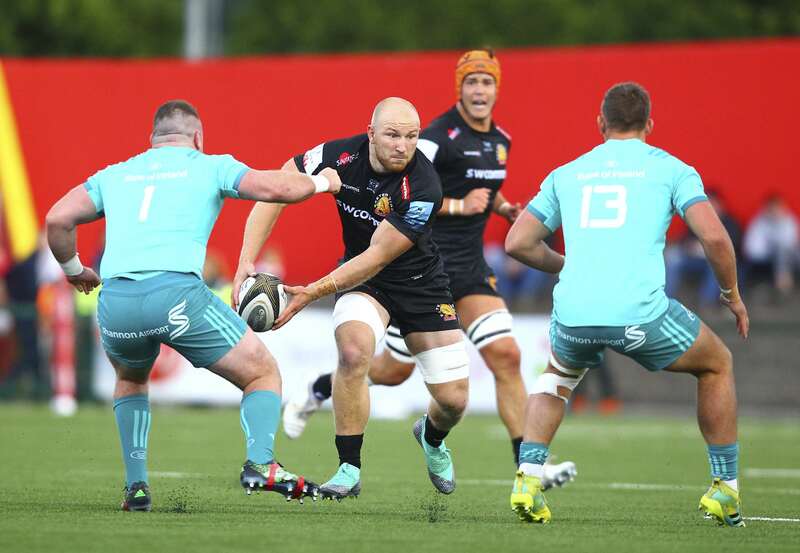 Having utilised a large number of his squad in last week’s double-header against the Cornish Pirates and Cardiff Blues, it was a powerful Chiefs line-up that took to the field in Cork. With the exception of Santiago Cordero, who featured impressively against the Pirates, Baxter stuck with a near identical starting XV that had seen off the Blues 38-10 at Sandy Park. Meanwhile, Munster – who they will face two more times this season in the Heineken Champions Cup – made six changes to their team that had seen off London Irish at the same venue just seven days earlier. Among those handed a start was summer signing Mike Haley, who has joined the Irish province from Premiership side Sale Sharks. With conditions perfect overhead and the 4G surface getting only it’s second run-out, it was the visitors who dominated the opening 40 minutes. Baxter’s side were hugely impressive from the outset, their forwards creating a healthy platform from which the back division, spearheaded by the experience Steenson, were able to work. Just ten minutes had elapsed when the visitors broke the deadlock through Woodburn. The Exeter winger was able to apply the finishing touch in the left corner after Ollie Devoto and Ian Whitten had caused mayhem in the home ranks. Devoto, out for much of last season with injury, was again catching the eye in midfield as he continually asked questions of his opposite number with some hard, yet direct running through the middle. The Chiefs were making all the running and it came as no surprise when they doubled their lead through Williams. The England international burrowed his way over from close range after move good work from Devoto, Whitten and Phil Dollman. Steenson, who had narrowly missed with his first conversion attempt, had clearly learnt from his previous effort, this time bringing his kick back cleverly on the strong cross-field breeze. Sadly, that would be Williams’ last meaningful action as he was forced to depart just moments later with a nasty looking leg injury. An untimely blow for the tight-head who was part of a dominant Exeter front-row trio. Munster did their best to find a way into the match, but despite some occasional moments of attack, they could find no way through the stubborn Chiefs defensive line. As half time approached, the Chiefs looked to add to their tally when Steenson combined brilliantly with Sam Skinner, whose galloping run down the right flank got him deep behind enemy lines, but in the follow-up play referee Sean Gallagher spotted a forward pass from the visitors and the chance was lost. After such a solid first half display, the Chiefs were looking to build on their advantage when play resumed after the break.Munster, though, had other ideas and having had time to regroup, they re-emerged a much vibrant force. They dominated both possession and territory in the opening exchanges, but they could find no way through what was a resolute rearguard action from the visitors. New defence coach Julian Salvi will have been heartened by the way the Chiefs threw themselves into every collision. To a man, everyone stood tall in the face of mounting pressure from the home side. Munster threw on fresh muscle from the sidelines, including former Northampton Saints playmaker JJ Hanrahan and South African forward Arno Botha, whose growing presence when picking up off the base of a series of close-range scrums had the Chiefs scrambling to keep him at bay. Although Munster were the dominant force, finding an end product was proving elusive as the Chiefs remained defiant.Hanrahan’s break, when he sliced through a gap left by Ollie Atkins and Elvis Taione, again caused panic in the visiting ranks, but Cordero was able to race back and cover the threat. Having survived the threat, it was the Chiefs who were able to then go on a rare second half offensive. A booming Henry Slade penalty from deep inside his own half got them back within sight of the home line, but they were unable to make their momentary spell of pressure tell and the chance came and went in a blink of the eye. As Munster continued to press, referee Gallagher warned the Chiefs that any more infringing close to their line may result in further sanction. A Hanrahan grubber in behind was safely seen off as a plethora of home attackers lay in wait, while yet more dominant defence from the Premiership outfit appeared to eventually subdue their Irish rivals. In the end, it was job done for the Chiefs who, after an attacking first 40, then underlined their defensive resolve with an equally impressive second half showing. A similar display, if not better, will be needed against the Tigers in a week’s time. Munster: M Haley (S Fitzgerald 61); D Sweetnam, D Goggin (I Keatley 61), R Scannell (S Arnold 43), C Nash (L Coombes 58); B Johnston (JJ Hanrahan 43), J Hart (N Cronin h/t); D Kilcoyne (J Loughman 58), M Sherry (K O’Byrne 43), B Scott (C Parker 32-70); J Kleyn (F Wycherley 43), B Holland (capt, D O’Shea 58); D O’Callaghan (S O’Connor 63), T O’Donnell (J Daly 18, G Coombes 70), G Coombes (A Botha 32, J Kleyn 73).